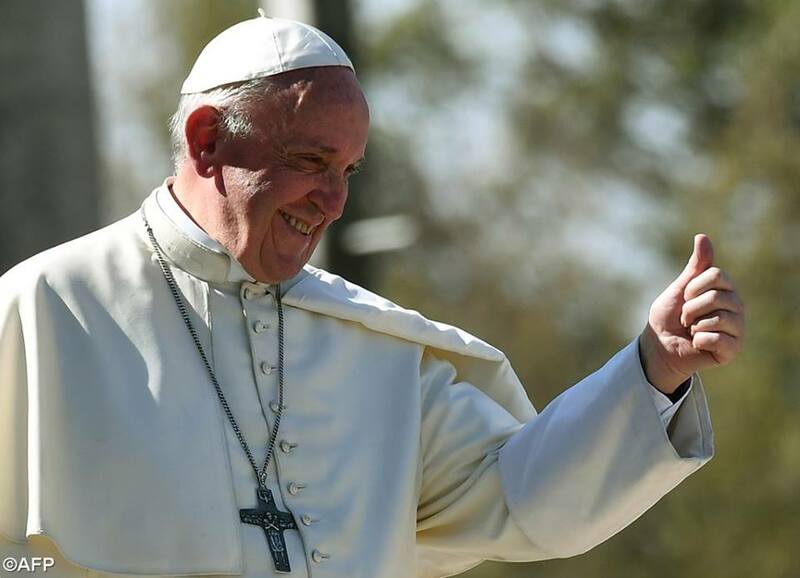 Please find below the full text of Pope Francis' address to the young people of Chile, gathered at the National Shrine of Maipu in Santiago. Ariel, I too am happy to be with you. Thank you for your words of welcome in the name of all present. I am the one who is grateful for being able to share this time with you. For me, it is very important for us to meet and walk with one another for a while. Let’s help each other to keep looking ahead! I am happy that this meeting is taking place here in Maipú. In this land where the history of Chile began with a fraternal embrace, in this Shrine that rises at the crossroads of north and south, that joins the snow and the sea, and is a home to both heaven and earth. A home for Chile, a home for you, dear young people, where Our Lady of Carmel waits for you and welcomes you with an open heart. Just as she accompanied the birth of this nation and has accompanied so many Chileans over the span of these two hundred years, so too she wants to keep accompanying the dreams that God places in your hearts: dreams of freedom, dreams of joy, dreams of a better future: the desire, as you said, Ariel, “to be protagonists of change”. To be protagonists. Our Lady of Mount Carmel accompanies you so that you can be protagonists for the Chile of which your hearts dream. I know that the hearts of young Chileans dream, and that they dream big dreams, for these lands have given rise to experiences that spread and multiplied across the different countries of our continent. Who inspired those dreams? It was young people like yourselves, who were inspired to experience the adventure of faith. For faith excites in young people feelings of adventure, an adventure that beckons them to traverse unbelievable landscapes, rough and tough terrain… but, then again, you like adventures and challenges! After all, you get bored when there are no challenges to excite you. We see this clearly, for example, whenever there is a natural disaster. You have an amazing ability to mobilize, which is a sure sign of the generosity of your hearts. In my ministry as a bishop, I have come to see how many good ideas there are in young people, in their minds and hearts. Young people are restless; they are seekers and idealists. The problem we adults have is that often, like know-it-alls, we say: “They think that way because they are young; they still have to grow up”. As if growing up means accepting injustice, believing that nothing can be done, that this is the way things have always been. Realizing how important young people and their experiences are, this year I wanted to call the Synod, and before it, the meeting of young people, so that you can feel – and really be – protagonists in the heart of the Church. To help keep the Church’s face young, not by applying cosmetics but by letting her be challenged deep down by her sons and daughters, to help her daily to be more faithful to the Gospel. How much the Church in Chile needs you to “shake the ground beneath our feet” and help us draw closer to Jesus! Your questions, your wanting to know, your desire to be generous, are all necessary for us to draw closer to Jesus. All of us are all invited, ever anew, to draw near to Jesus. Let me share a story with you. Chatting one day with a young man, I asked him what sort of things made him unhappy. He said to me: “When my cellphone battery runs down or I lose my internet connection”. I asked him: “Why?” He answered: “Father, it’s simple; I miss out on everything that is going on, I am shut off from the world, stuck. In those moments, I jump up and run to find a charger or a Wi-Fi network and a password to reconnect”. This made me think that the same thing can happen with our faith. After a while on the journey or after an initial spurt, there are moments when, without even realizing it, our “bandwidth” begins to fade and we lose our connection, our power; then we become unhappy and we lose our faith, we feel depressed and listless, and we start to view everything in a bad light. When we lack the “connection” that charges our dreams, our hearts begin falter. When our batteries are dead, we feel the way the song describes it – “The background noise and the loneliness of the city cut us off from everything. The world turns backwards, tries to overwhelm me and drown all my thoughts and ideas”. Without a connection, a connection to Jesus, we end up drowning our thoughts and ideas, our dreams and our faith, and so we get frustrated and annoyed. As protagonists, which we are and we want to be – we can get to the point of feeling that it makes no difference whether or not we do anything. We start feeling that we are “shut off from the world”, as that young person told me. It worries me that, once they have lost their “connection”, many people think they have nothing to offer; they feel lost. Never think that you have nothing to offer or that nobody cares about you. Never! That thought, as Alberto Hurtado used to like to say, “is the voice of the devil”, who wants to make you feel you are worthless… and to keep things the way they are. All of us are necessary and important; all of us have something to offer. The young people in the Gospel we heard today wanted that “connection” to help them keep the flame alive in their hearts. They wanted to know how to charge the power cells of their heart. Andrew and the other disciple – whose name is not given, so we can imagine that each of us is that “other” disciple – were looking for the password to connect with the one who is “the way, and the truth and the life” (Jn 14:6). It was John the Baptist who showed them the way. I believe that you too have a great saint who you can be your guide, a saint who made his life into a song: “I am happy, Lord, I am happy”. Alberto Hurtado had a golden rule, a rule for setting his heart ablaze with the fire that keeps joy alive. For Jesus is that fire; everyone who draws near to it is set ablaze. Hurtado’s password was quite simple – if your phones are turned on, I would like you to key this in. He asks: “What would Christ do in my place?” At school, at university, when outdoors, when at home, among friends, at work, when taunted: “What would Christ do in my place?” When you go dancing, when you are playing or watching sports: “What would Christ do in my place?” He is the password, the power source that charges our hearts, ignites our faith and makes our eyes sparkle. That is what it means to be a protagonist of history. Our eyes sparkle, for we have discovered that Jesus is the source of life and joy. Protagonists of history, for we wish to pass on that sparkle to hearts that have grown so cold and gloomy that they have forgotten what it means to hope, to all those hearts that are “deadened” and wait for someone to come and challenge them with something worthwhile. Being protagonists means doing what Jesus did. Wherever you are, with whomever you are with, and whenever you get together: “What would Jesus do?” The only way not to forget a password is by using it over and over. Day after day. The time will come when you know it by heart, and the day will come when, without realizing it, your heart will beat like Jesus’ heart. It is not enough to hear a sermon or learn an answer from the catechism; we want to live the way Jesus lived. To do that, the young people in the Gospel asked: “Lord, where do you live?” (Jn 1:38). How do you live? We want to live like Jesus, with that “yes” that thrills our hearts. To put oneself on the line, to run risks. Dear friends, be courageous, go out straightaway to meet your friends, people you don’t know, or those having troubles. Go out with the only promise we have: that wherever you are – in the desert, on the journey, amid excitement, you will always be “connected”; there will always be a “power source”. We will never be alone. We will always enjoy the company of Jesus, his Mother and a community. Certainly, a community is not perfect, but that does not mean that it does not have much to love and to give to others. Dear friends, dear young people: “Be young Samaritans, who never walk past someone lying on the roadside. Be young Simons of Cyrene who help Christ carry his cross and help alleviate the sufferings of your brothers and sisters. Be like Zacchaeus, who turns his heart from materialism to solidarity. Be like young Mary Magdalene, passionately seeking love, who finds in Jesus alone the answers she needs. Have the heart of Peter, so that you can abandon your nets beside the lake. Have the love of John, so that you can rest all your concerns in him. Have the openness of Mary, so that you can sing for joy and do God’s will. Dear friends, I would have liked to stay longer. Thank you for this meeting and for your joyfulness. I ask you one favour: please remember to pray for me. CARD. RAÚL SILVA HENRÍQUEZ, Mensaje a los jóvenes (7 October 1979).